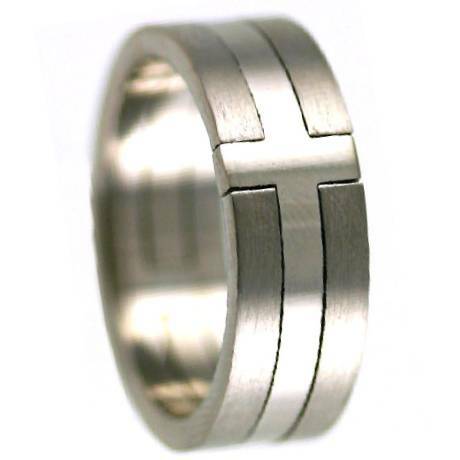 Faith does not make things easy; it makes things possible.For those wanting to honour their commitment to God in a unique way, this attractive cross ring is a great pick.With high polish, clean lines, and a subtle two toned contrast design, this beautiful ring carries with it a valuable, simple beauty that is rare to find. I like it, but didn't realize it was two totally different pieces. It's nice but it tends to gather crud in the joints and you've gotta take it apart to clean it out. Not a big deal unless you're working while wearing it. 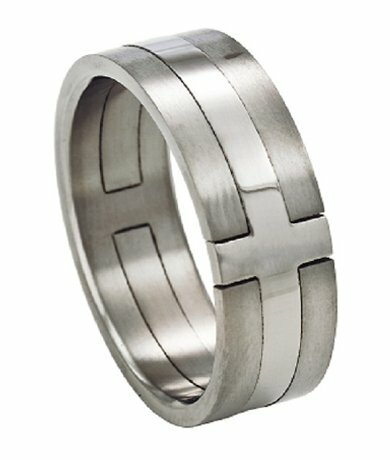 I bought this as a replacement for my husband's gold wedding ring that scratches very easily. It's a great looking ring and we both love it. A couple of cons though, the cuts between the two pieces are crooked / jagged, after a week of wear the ring has a couple of scuff marks (my husband is a computer programmer not a construction worker so I'm not sure what they are from), but for $25 you can't really complain! The space between the two rings pinches my husbands face when he leans his face on his hand. The edges of the ring are not rounded, which gives it a look I love, but my husband commented that it is certainly not a comfort fit ring. All around we quite pleased with the ring & it shipped very quickly. 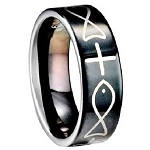 Great price, Great customer service, Fast shipping and Beautiful ring. What more can you ask for? This ring is one of two 10th anniversary gifts I gave my husband. In addition to the unique setting of the cross, he particularly likes how comfortable it is to wear. It has a simple beauty about it and my husband wears it with great pride. like the ring up close and personal compare on picture, came on time.